It’s time to take a look at the next Marvel Cinematic film! Even though we get 2-3 of these a year, it always feels like such a long wait until the next one. This one has been a long time in the making as Black Panther got a lot of fans after his appearance in Civil War. He was definitely a highlight in that film and remains a great lead in this film. The movie does a good job of not letting the jungle limit it and we do get quite a few nice city scenes as well. All told, it’s a solid addition to the MCU and I’d be up for a sequel although I don’t think there is too much more they can do here in Wakanda so a sequel would probably need to take place at one of the other bases. The film starts with a quick recap of Wakanda history. We then see the previous Black Panther murder a traitor which sets up the main plot. Right after Black Panther is crowned King of Wakanda, another member of royal blood has shown up to take it back. King T’Challa must now learn what it means to be King and if he even wants to rule such unloyal followers. Either way, he has a duty to stop this villain from launching an attack on the rest of the world or Wakanda will face severe retaliation of the Avenging kind. I had one big fear when walking into this film and that was that the movie would resort to animal violence since part of Wakanda is essentially a jungle. Then just when I thought I was safe, 3 large Rhinos showed up. Fortunately the film went out of its way to ensure that none of them were hurt. Panther trapped one, a second just ran off, and the third one turned good. Once this scene had been played out, I knew that the film was going to be safe. We also mitigate the jungle aspect as most of Wakanda is actually very high tech and sci-fi esque. I definitely enjoy seeing technology and cities the most so this was good for me. I’m still not a fan of any landscape that isn’t a city of some kind or the inside of a high tech facility. Those just make for the best scenes if you ask me. The best scenes of the film all take place in the city for the most part. The opening fight scene with Klaw and his gang was handled really well. Panther’s new suit made for some good action effects like when he totaled the car. The old suit was bullet proof which is great, but this one does all of that and more. While the suit is shown to have limitations, this should help him keep up with heavy weights like Spider-Man now. In theory, Captain America would probably lose at this point since their fight was already very close and now landing any damage on Black Panther will be very difficult. It’s a really useful power up and with all of the new tech Panther’s sister is coming up with, he is only going to get stronger. Pretty much all of the hand to hand fights here are really good. The scene where both Panthers are decimating the opposing armies was a nice contrast as they are both way stronger than the rest of the fighters. Of course, that’s why Black Panther needed to hurry and take the other one out since casualties would run high. Even with this, the film does a good job of making the warriors look reasonably strong. I’d personally say that they looked more impressive than the Amazons in Wonder Woman as these seem to know how to fight and wouldn’t get caught off guard by bullets from people right in front of them. The film also corrects one more thing from the WW film. In that title we learn that the Amazons are also hiding in plain sight by having their island just appear as more water. This doesn’t work for obvious reasons. People just fly through there anyway and then the illusion fades. They would get found out in no time. In Black Panther, the illusion is backed up by being an actual country with borders. They have soldiers and weapons deter anyone from approaching. The deception is simply in appearing to be poorer than they actually are. Maybe this will still be a bit of a stretch for some, but it’s much more believable if you ask me. Black Panther is a very solid character as I mentioned earlier. While his best appearance will likely always be in Civil War as his character was perfect there, he doesn’t really do anything wrong here. Maybe he should have been quicker to throw the villain out or done more to prevent Klaw from escaping, but you can’t expect him to think of every possible contingency. Thanks to the ritual fights forcing Panther to be in human mode, we do see a more vulnerable version of him. His hand to hand skills actually may be under Bucky, Black Widow, and some of the other hand to hand characters in the series as he has trouble with various fighters, but granted, he should always have the Panther serum for future films so it shouldn’t be a problem. He’s still more than proficient as only high level fighters can hope to defeat him. He may be King, but Panther isn’t stuck up or arrogant yet which is good. Part of why he can be annoying in the comics is that he ends up being like Black Bolt at times where he seems completely corrupt with power. I don’t think the films will be going that route. Ross is a surprisingly great character and was actually my favorite in the film. He’s a very confident CIA agent who doesn’t back down from anyone. His illegal dealings with Klaw may be suspect, but I get the feeling that he was going to double cross the villain. He’s quick on his feet and an ace pilot as well. He’ll certainly be fun to have around for future films and I’m glad that the CIA has at least one really good member. It seems like they’ve been playing second fiddle to SHIELD for a while so it’s time to finally surpass them. Ross doesn’t really have any bad scenes. Another really good character is Panther’s sister Shuri. She recently got to appear in an animated Avengers episode and based on her portrayal there the film’s depiction was also very accurate. She’s a genius with tech and has come up with many great inventions in a short span of time considering that this takes place only around a week after Civil War. Considering that a big threat like Thanos and his army won’t go down to brute force so easily, her tech will come in handy. She’s not afraid to get on the front lines as well and is just a very charismatic character the whole time. Killmonger is the main villain of the film and he’s pretty cool. Even before becoming the Panther Killmonger was a very talented fighter as he racked up kills in many different countries. It was interesting to see how he was an undercover agent for the CIA who managed to use the heroes and villains until he finally got into Wakanda. To an extent I do have to question how he knew so much about Wakanda though. He knew about the traditions and seemed just very well aware of the culture in general. We can assume he found the location from the book and since his father was okay with him finding it, maybe that’s when he learned everything. Maybe the book was also just very detailed. Getting Klaw was easy enough since it was relatively common knowledge that he was the one who broke into Wakanda the first time. Killmonger does continue the Marvel tradition of having a villain who has the same abilities as the main hero as he and T’Challa are essentially copies of each other, but that doesn’t really matter to me all that much as long as the fights are good and they were here. I didn’t care for Klaw though. He’s just not my kind of villain and seems to just get lucky all the time. He’s just a normal guy with a sonic cannon and he isn’t even all that fit. I don’t know how he escaped for this long, but it definitely seems like a stretch. He’s wanted by basically every powerful person on the planet so where can he possibly hide? Well, his plot seems to have finally wrapped up here and I won’t miss him. Okoye was a good member of the Wakanda special forces and is certainly one of their best fighters. Her best combat appearance is probably in the club where she beats up quite a few special agents, but she also puts up a reasonable fight against Killmonger. At that point, tech just beats talent, but otherwise I don’t see any Wakandan fighter beating her in a fair battle. W’Kabi is a pretty terrible character. I can’t say much about him, but you’ll probably know where his character is heading right from the start. It’s similar to a character beat we saw from Doctor Strange only this one is probably more petty. There’s definitely no saving this character. Nakia is a decent character. She doesn’t get much to do and is overshadowed by the others, but isn’t bad. I do wish we could have avoided the token romance which doesn’t add anything to the film and just seems to be filler, but I guess it wasn’t given much of a focus so it could have been a whole lot worse. Nakia’s Tron Discs were cool though. Between that and the Energy Cannons, we had quite a lot of good weapons that have a lot of potential for future films. She just need a hoverboard or air boots to help her maneuver quicker. Baku’s a fun character s well. He definitely has a strong sense of honor and will repay his debts. When he accepted his defeat gracefully without trying any cheap tricks I had a feeling that he would be a good character. He also has a point that Killmonger beat Black Panther in a fair fight so calling it murder was a little drastic. Blame the outdated ritual system, not the player. Baku made the right decision in the end though and really came through for the heroes. It can be hard to feel bad for Wakanda when they have such poor traditions though. Why should Black Panther have to fight to be king anyway? I guess it’s to give the other tribes a way to be King, but since it will just cause tensions and potentially get them to split again it doesn’t really seem to be practical. I’m pretty sure T’Challa learned his lesson with that though and probably abolished that rule very quickly. Also, the fact that it’s possible to suffocate underneath the dirt they throw on your for the ceremony is another part where you have to shake your head. What’s with all of these unnecessary risks? Killmonger may not have done it for the right reasons, but at least thanks to him these traditions are probably gone as well. On a side note, I was wondering where Bucky and Captain America were hiding the whole time, but I guess getting involved in this fight would have just made things more complicated. Panther could have certainly used some backup, but it all worked out. I really enjoyed the soundtrack here. I didn’t care much for the Lion King themes or the tribe tradition music, but a lot of the tunes were surprisingly techno/electronic. It seems like this theme would pop up whenever the villain showed up and basically for any action scene. Good music makes the whole presentation that much better and it definitely worked really well here. I’d say that as far as MCU soundtracks go this would definitely be in the top half. The visuals are also really good. I do like the purple energy that the suit gets from taking a hit and the metallic invention room that the sister uses looks cool. It’s a pretty nice set up for sure. The writing is also solid as you’d expect. The one liners between the characters are usually pretty solid. Killmonger adding a more modern/slang spin to Wakanda was also rather nice. He acts as a bridge between the new and old ways to an extent. The film does have some of the weakest after credit scenes though. The first one just feels like it should have been the actual ending. It’s not really teasing a lot considering you knew this was where Panther was going with the idea. It’s not a bad scene, but it’s not really much of a stinger either. The second scene is far worse as it is showing us something that we’ve already known. It isn’t even a good character that we see and is just rather boring. You could feel the theater letting out a sigh as we waited for something else to show up and then the clip ended. These scenes are just bonus so they can’t hurt a film at all, but I was still hoping for something a little more hype. So where do all of the Avengers stack up power-wise now? I’d list the rankings as 1. Thor 2. Hulk 3. Dr. Strange 4. Spider-Man 5. Iron Man 6. Vision 7. Black Panther 8. Captain America 9. Scarlet Witch 10. Black Widow 11. Ant Man 12. Hawkeye. For now I’m not counting the Guardians or the helpers like War Machine and Valkyrie, but I’ll do a more complete list for Infinity War. The suit was definitely enough for Panther to finally pass Cap. Strange could potentially pass Hulk depending on how powerful his magic is in Infinity War and by the same token Vision could drop behind Panther and Cap if he looks really bad without his Gem. Some of these matchups are pretty close so a power up can make all the difference. Overall, Black Panther is a fun and engaging film. It’s pretty fast paced for the most part so it comes across as very exciting the first time around. I do think it will lack in replay value to an extent because some of the dialogue will likely drag on the second time around along with the flashbacks. When the action is happening the film is at its best but we do get some reasonably long breaks in between the action like getting Panther back into fighting shape and having the council of Wakanda chat about things. The writing is strong though and the cast is good though so it’s certainly a movie that I’d recommend to everyone. It’s good to see another Marvel hero get a stand alone film and we are one step closer to Avengers Infinity War now. I have high hopes for that film and am fully expecting it to be one of the best MCU films yet. There are just so many good ways that the film can play this out that I have to assume they will choose one of them. It’ll be cool to see Panther lend his might to the team as well. Only a few short months left. 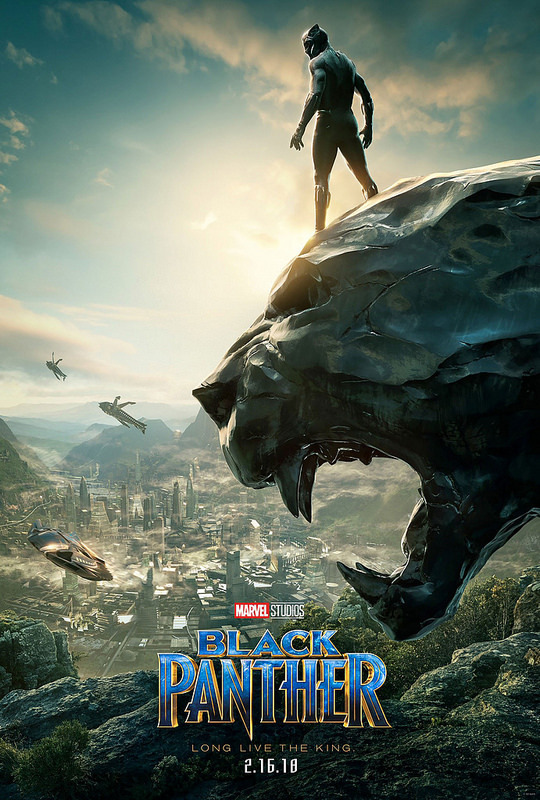 This entry was posted in Live Action Movie Reviews, Live Action Movies, Reviews and tagged Action, Black Panther, Comic Book Movie, Film Review, Jungle, Marvel, Movie Review, Review, Stan Lee, Thriller by dreager1. Bookmark the permalink. Great review! I enjoyed Black Panther a lot as well, a very exciting film. Thanks! Yeah, now it’s going to be hype to see him return and take on Thanos or at least one of the Black Order members. Really enjoyed watching the movie last night Good review! Black Panther’s sister was excellent! MCU totally rocks with these sound tracks! Looking forward to seeing the old effective team-up with Captain America, Black Panther, and Hawkeye at some point during Infinity War. Definitely, those 3 will be very hard for an enemy/group of enemies to defeat. It was certainly a blast and now the anticipation for Infinity War is as high as ever. Marvel is really firing on all cylinders! I’m probably going to see this soon. It’s time a fantasy adventure picked Africa for a setting and time for a native African superhero to be the central protagonist. I saw it yesterday aaaand…I LOVE IT!